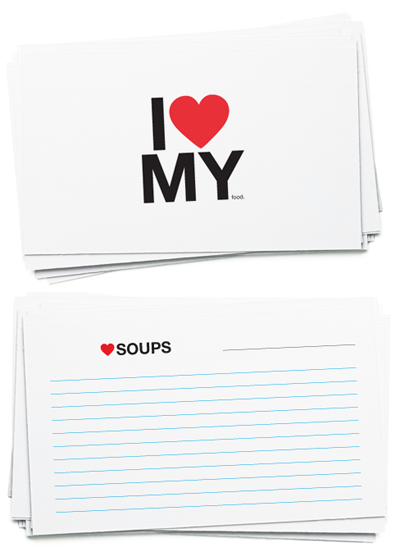 A take-off on the iconic "I love NY" logo, this "I love my food" recipe set from Scissors Paper Wok is a nifty download. Print your own cards for soup, salad, sauce, baking, roast, drink, dessert, bread, breakfast, main dish and side dish. Though if I had my way, I'd eat only bread and dessert, but I've heard you're not supposed to do that. Get the cards right here. These are fabulous! Thanks for sharing them. Such a great idea...I will definitely print some. Thanks! So cute. And yes, a good chocolate with a hot loaf of crusty bread? Heavenly. These are super cute. I'm excited to write out some recipes on these - I need every bit of encouragement to cook wherever I can find it! I printed some!! These are so cute! Have to bring some recipes to a bridal shower, this made them soo much cuter. Excellent! I think it would be fun to make a little booklet of recipes attached at the corner with a metal ring, and use the big "I heart MY food" sheet as the cover. These are super cute. I am always looking for recipe cards for my mom and these will hit the spot. I thought it was 'I love Malaysia' until I saw the tiiiny 'food'. Maybe I am a little too patriotic. No, I can totally see why you'd think that!